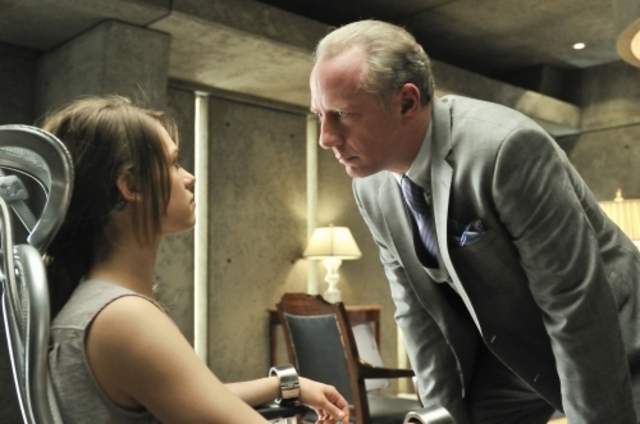 Percy (Xander Berkeley) had Nikita’s (Maggie Q) mole, Alex (Lyndsy Fonseca) in his power. Amanda (Melinda Clarke) wanted to interrogate her, but Percy wanted her canceled – until he learned that “Alex” is actually Alexandra Udinov, the daughter of a powerful Russian crime lord killed by Division. Then he decided to turn her against Nikita. Amanda tried to get information about Operation: Sparrow, but Percy stonewalled her. She and Michael (Shane West) tried to bluff each other that they were privy to more information than the other had. Percy really did have info that Michael didn’t: He knew Michael was cooperating with Nikita and Alex. Meanwhile, Nikita kidnapped an expert to figure out how to open Percy’s black box, believing it held the key to Operation: Sparrow. Percy sent Alex back in to “pull the trigger” on Nikita. The episode ended with a bang as Alex literally pulled the trigger and shot Nikita.